Background: Evidence now suggests that precision medicine, which is sometimes used interchangeably with personalized medicine, is becoming a cornerstone of medical practices by providing the right patient with the right medication at the right dose at the right time. In the light of the recent advances in biomedical computing and big data science, more and more genetic variants associated with human diseases and treatment response are being discovered in precision medicine applications by leveraging multi-omics and machine learning approaches. 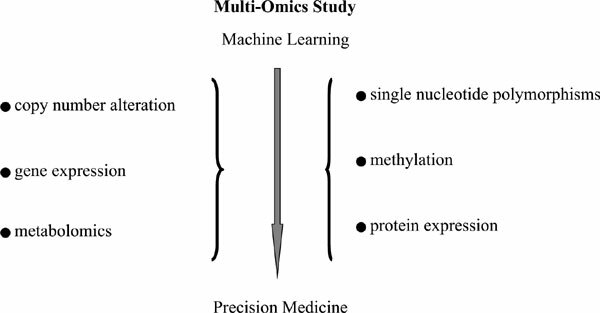 Objective: In this review, a key question is whether multi-omics approaches outperform the traditional single data type analysis in various multi-omics studies. Method: We focus on the most recent developments for cancer research in precision medicine using machine learning and predictive algorithms, together with multi-omics data. Results: First, we describe different machine learning approaches that are employed to assess whether biomarkers are correlated with diseases and treatment responses in various multi-omics studies. We also survey probable biomarkers that have been identified to be involved in diseases and treatment responses such as recurrence and survival in ovarian cancer. Furthermore, we summarize the limitations with respect to the mentioned multiomics studies. Finally, we address a discussion of future directions and challenges. Conclusion: Predictive models based on multi-omics data could be more powerful than those based on a single data type. Future replication studies with much larger sample sizes are essential to confirm the role of the biomarkers identified in these multi-omics studies and will seemingly have key contributions for precision medicine. Biomarker, genomics, machine learning, multi-omics, personalized medicine, precision medicine, pharmacogenomics, single nucleotide polymorphisms.